Disaster recovery of applications and services is a key component to provide continuous business services. IBM Geographically Dispersed Resiliency for Power Systems is a disaster recovery solution that is easy to deploy and provides automated operations to recover production site. This article explains the configuration process for IBM Geographically Dispersed Resiliency for Power Systems. This includes hardware setup from Hardware Management Console (HMC) and storage setup for disk replication along with configuring resources that are monitored by the solution. Disaster recovery (DR) and high availability (HA) solutions are mainly based on two types of technologies: Cluster-based technology and virtual machines (VMs) restart-based technology. The cluster HA and DR solution typically deploys redundant hardware and software components to provide near real-time failover when one or more components in the configuration fails. The VM-based solution relies on the out-of-band monitoring and management option to restart the virtual machines on hardware failure in an infrastructure. The Geographically Dispersed Resiliency solution is based on the VM restart technology. Figure 1 shows the basic setup for the Geographically Dispersed Resiliency solution to be implemented for many subsystems. The Geographically Dispersed Resiliency solution provides a highly available environment by identifying a set of resources that are required for processing the VMs in a server during disaster situations. KSYS should be on IBM AIX® 7.2.1 or later operating system level. Hardware Management console must be version 8.60 or later. VIOS version should be 2.2.5 or later. Each virtual machine can support Linux (Red Hat and SUSE), Ubuntu and AIX. Hardware platform for each virtual machine must be IBM POWER7® or later processor-based server. Configuration of only two sites is allowed. Active site and backup site should be separated by an unlimited distance (may be at different geographic locations). KSYS machine can be placed at backup site or outside Geographically Dispersed Resiliency configuration. Target system must have sufficient resource and if not enterprise pool for capacity on demand must be configured. The LPARs should not have physical adapters. Geographically Dispersed Resiliency solution supports EMC storage VMAX family (VMAX1, VMAX2 and VMAX3). The EMC storage must be Symmetrix Remote Data Facility (SRDF)-capable. Asynchronous and Synchronous replication mode is supported. All virtual machines managed by the Geographically Dispersed Resiliency solution must be virtual I/O resources through VIOS. The VM must not be connected to a physical network adapter or any dedicated devices. The VIOS must have a Shared Ethernet Adapter configuration to bridge to the same Ethernet network between hosts in the same site. Same virtual local area network (VLAN) ID must be configured across sites. The KSYS partition must be connected to all the HMCs. All the VIOS partitions and disk pairs must be deployed correctly across sites. Storage area network zoning and connectivity must be functional as required on both the sites. In summary, Geographically Dispersed Resiliency enables extremely simplified disaster recovery management for IBM Power Systems™. In less than 10 steps, an administrator can deploy and configure the Geographically Dispersed Resiliency solution. This is the only solution on IBM Power® that offers non-disruptive DR testing. You can refer to the following articles for topics related to IBM Geographically Dispersed Resiliency for Power Systems. Retaining VM time stamp after IBM VM Recovery Manager DR/HA migration: IBM VM Recovery Manager DR for Power Systems provides an easy way to deploy and manage high availability solution for data centers. It enables a virtual machine (VM) restart-based high availability (HA) solution across a group of hosts (servers). How to safeguard the KSYS node in IBM Geographically Dispersed Resiliency for Power systems: This article explains about easy deployment model that uses a controller system to monitor the entire virtual machine environment using flexible failover policies and storage replication management. Configuration of Enterprise Pool for Capacity on Demand with IBM Geographically Dispersed Resiliency for Power Systems solution: This article explains how to use IBM geographically dispersed resiliency seamlessly with Power enterprise pools. This also provides information about Capacity of Demand (CoD) concepts involved in configuring resources using HMC command line interface and graphical user interface (GUI). Disaster Recovery as a Service (DRaaS) offering using IBM Geographically Dispersed Resiliency Solution for Power Systems: This article provides information regarding disaster recovery as a service, where customer only needs to bear the cost for production server. Disaster recovery backup server will be maintained by a service provider. 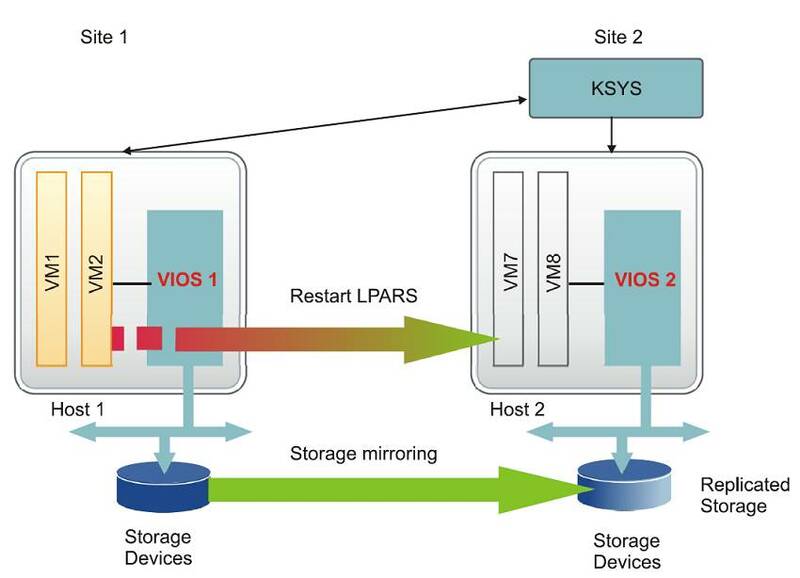 Preserving redundant VIOS configuration on production site with IBM Geographically Dispersed Resiliency solution: This article explains how to preserve the VIOS configuration on the production site after DR from backup site to production site back. Bidirectional supports for disaster recovery using IBM Geographically Dispersed Resiliency for Power Systems: This article explains about how IBM Geographically Dispersed Resiliency for Power Systems can support bidirectional approach for disaster recovery. This also demonstrations how KSYS on both the sites manages the virtual machine environment. A simplified approach to hardware upgrade using IBM Geographically Dispersed Resiliency for Power Systems: This article provides a step-by-step walkthrough on how to keep application workloads running when there is a need to plan downtime of hosts for hardware upgradation.